“Let’s Change Something Before Climate Changes Everything.” The City of Edmonton’s Change for Climate initiative issues this provocation, meant to compel Edmontonians into “taking action” on climate change. Just Powers attended the Change for Climate Talks at MacEwan University, where 11 speakers demonstrated how they were acting on climate change, and urged the audience to follow. Councillor Michael Walters (Ward 10) drew attention to the carbon emissions released by cities, and the numerous steps the City is taking to reduce these emissions locally: A redirection of new building costs toward renewable energy, the sustainable Blatchford community, public and active transportation initiatives, and so on. Architect Vivian Manesc (Manasc Issac Architects) presented on emerging trends in sustainable design and green buildings, saying that we need to reimagine the building supply chain, to remember that design “casts the biggest shadow” in terms of carbon contribution. As such, she urged us to think carefully about how we plan future building and demolition projects to be more environmentally supportive. She also introduced many of us to the concept of energy-producing “building skin” and biomimicry used in projects like the Red Deer College Residence. Louis Bull Tribe Councillor Desmond Bull spoke about his community’s solar initiative, which has so far resulted in 188 kilowatts of solar energy provided by public buildings. He told the audience because “We Are All Treaty People,” we should address climate change as a collective. Professor Mike Flanagan (University of Alberta) presented on climate change’s impact on the fire season and the likelihood of more and more catastrophic wildfires. Alyssa Lau, co-founder of New Classics Studios introduced the “slow fashion movement” — a movement dedicated to promoting sustainable and more ethical clothing and clothing practices. 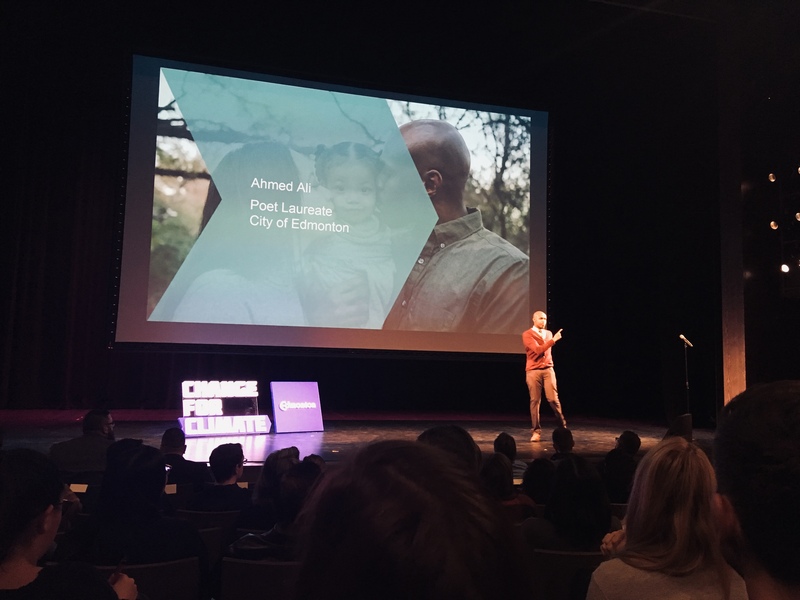 Edmonton’s poet laureate Ahmed Ali shared his poetry, and teacher Aaron Dublenko (Queen Elizabeth High School) shared how his school has become Canada’s “Greenest School” through student-led and student-driven projects. Cam MacDonald (Right at Home) presented on the North Glenora Net Zero Project, a net-zero community built on former church land for immigrant families. Melissa Gorrie told us about Waste Free Edmonton and her efforts to reconsider our relationship with single-use plastic. Chef Scott Downey (The Butternut Tree) talked about the local and sustainable farming and food production practices he uses at his restaurant, and Kieran Ryan talked about his initiative, Pogo Carshare, and how alternative transportation can help us rethink our relationship to cars. By his estimation, Pogo has taken 1000 cars off the Edmonton roads.